At FlipCon14 last week I learned about two good techniques to help encourage/require students to read or watch or otherwise take in and engage with learning content that you assign them in your flipped or blended classroom. Today I share one of these and I will write about the other soon. “WSQ” (pronounced “whisk”) is a pretty simple idea, but like most ideas, the power of how it is used is in the details and application of it. Teachers can choose how to apply and leverage this as it works best in their classes, and evolve it over time to improve on it and adapt it to changing student and course needs. Watch – The students watch the videos and are required to take notes. A variety of approaches can be used regarding what they are to do with those notes. You may want them turned of for credit or not. These notes not only help students construct and reinforce their learning, but they can play an important role in the next two steps, so keep that in mind. Also remember that most students (no matter what their ages) are often lousy at taking notes, so be sure to give them guidance. You may also want to consider using a Notes Outline that is pre-populated with some content, and having them complete it. Summarize – Crystal says it well in her summary, so I’ll stick with that. “Students have to write a summary of what they watched in the video. This is supposed to be completed immediately after watching to pretty much judge “Did you understand what you just watched?” I tell the students that their summary tells me if they understood the video or not. If I can’t make sense of their summary, then they probably didn’t understand it well enough because they couldn’t verbalize it. I tell them that if they can’t summarize it, they need to re-watch it because they didn’t get it.” What they are to do with these summaries is up to you, but I think that many teachers would agree that requiring them to post or hand them in and associating some part of their grading with them is essential to success. Again, you have to consider what sort of requirements to build around this question. I intend to require the Summary and Question to be submitted in a Discussion Forum in the Emerging Information Technologies course I will teach this fall. We will start some days by opening class with with a discussion around some of these questions (as well as focusing on addressing any misunderstandings or confusion with the materials that might be evidenced by the summaries and questions). I will also associate a portion of the course with grade (probably around 20%) with the completion of the Summaries and Questions, to really help reinforce their importance. Crystal starts her classes by having students discuss these questions in small groups, and other teachers have used the questions in other ways. Be sure to check out Crystal’s post to explore this further. There is also a chapter dedicated to Crystal’s work in Sams and Bergmann’s new book, Flipped Learning: Gateway to Student Engagement. 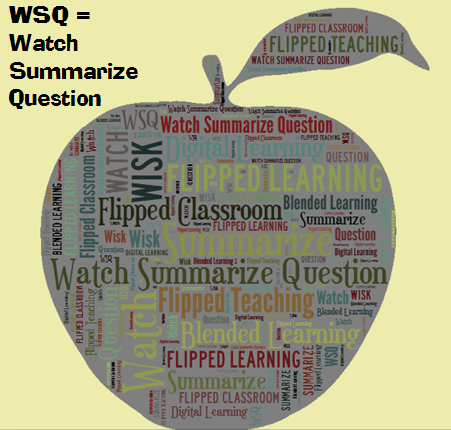 So there you go – I hope you’ll give WSQ a try in your classroom and tell us how you make out with it!